This blog post was first published in July 2014, but is relevant today and we have reposted it as it may be of interest to more recent donors. That equates to tens of millions of nets per year. Globally, if we can find the funds, we can ensure 180 million people will be protected from malaria. For our part, we are in discussions with a number of countries about their funding needs which range from 3m to 25 million nets. We are in close contact with other funders who will fill some or all of the funding for individual countries. In particular, the Global Fund will shortly announce its allocation of funding for countries for the period 2018-2020 from its three-year replenishment cycle. Note: US$500m is the estimated funding gap after the Global Fund has made its funding allocation. 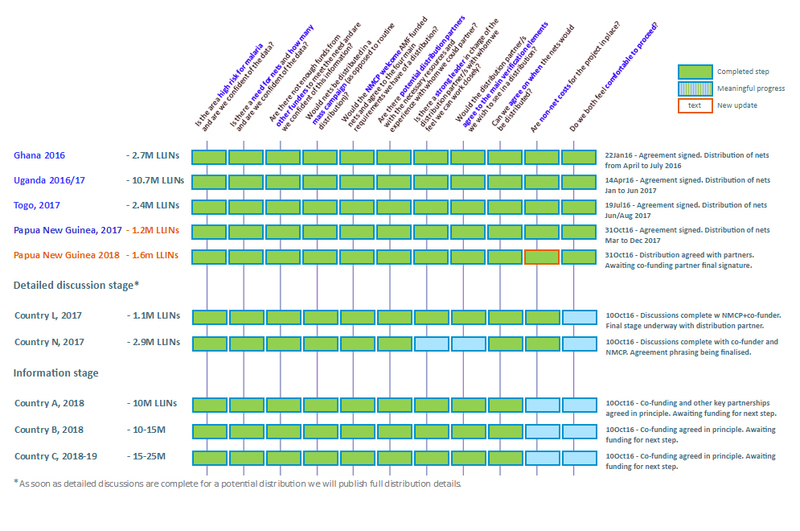 The distributions we are discussing are for 2018 and 2019 as commitments need to be in place two years ahead of nets being distributed for countries to properly plan whole-country universal coverage campaigns. These campaigns are significant logistical operations. There may also be net gaps for distributions in late 2017 that become apparent in the first part of 2017. Those net gaps would require quick action, and uncommitted funds in hand, to be filled. AMF's gap for more funding remains very large and we agree with GiveWell's assessment that it is between US$80m and US$200m for the coming year. We continue to focus on raising funds to maximize what we are able to contribute. Each additional donation increases the quantity of nets to which we can commit, so we are very grateful for every single donation. 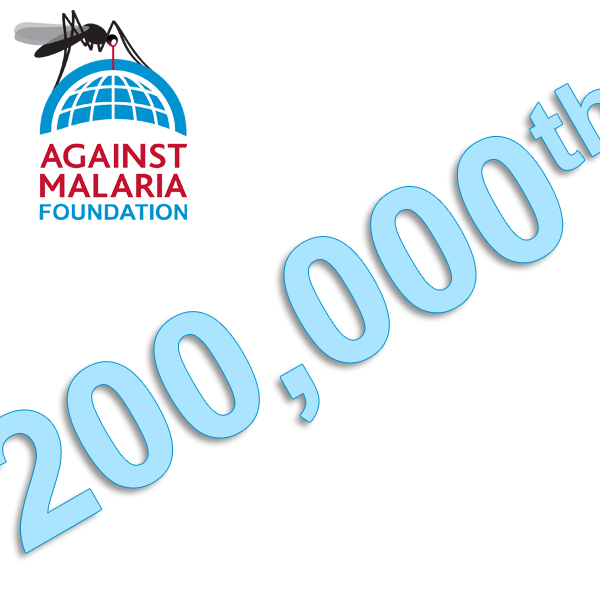 200,000th donation and 4 x US$1m! These numbers illustrate AMF's two equally important categories of donation and our progress. 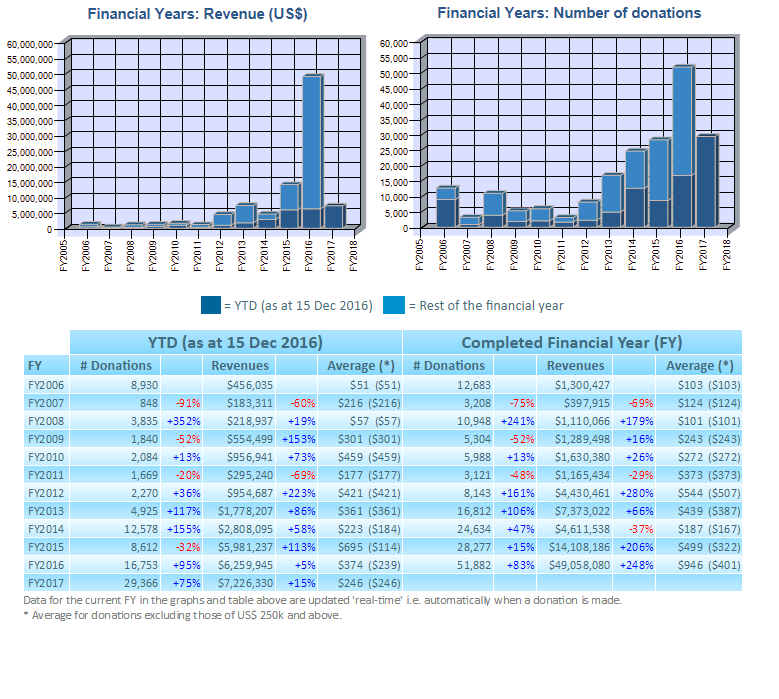 Most donations range from a few dollars (and £, €, CAN$, NZ$, AUS$ etc) to many thousands. In the most recent financial year we received 51,882 donations totaling US$49.1m (up from $14.1m the previous year) and we are thrilled to have just received our 200,000th donation! We are really pleased there are donors in so many countries, 182, contributing together to the fight against malaria. A few of the donations we receive are for hundreds of thousands of dollars or more. We are delighted to have received news of four donations, each for US$1m, from donors who visited two of our projects in Africa. Together, they will allow us to buy another two million nets to protect 3.6 million people. 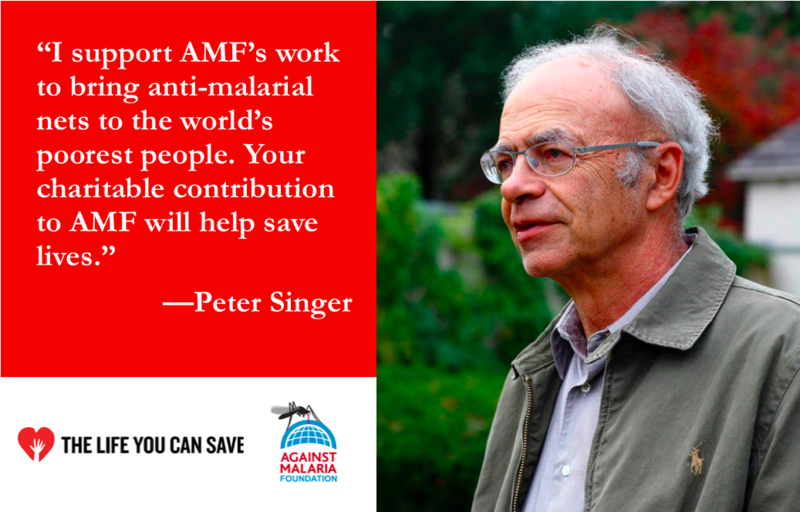 Both groups of donors are important to AMF's work. Without the combined power of the majority donors, our bedrock support, we could not fund the millions of nets we do. Without the major donors, we would not be able to increase significantly the quantity of nets we fund. We are so grateful for your support. Thank you. The Life You Can Save (TLYCS) has updated its list of recommended charities and we are delighted to be ranked as a top charity for the sixth year running. Over the last year TLYCS has influenced* over 6,600 donations to AMF from 1,582 donors in 68 countries totalling US$3.61 million, including almost 20% of the recurring donations made to AMF. We are immensely grateful for this confidence and support. * For those donors who told us TLYCS influenced their donation.